While Thee Michelle Gun Elephant are the reigning kings of garage rock in Japan, Electric Eel Shock has set its sights on the rest of the world. With a grueling tour schedule that includes regular trips to the United States and Europe, the young trio has garnered rave reviews for its wild live shows. 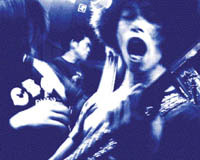 Like eX-Girl and Shonen Knife before them, Electric Eel Shock has developed a stronger fan base outside of Japan as a result of its travels.